(Management) George N. Gillett Jr. Le Centre Molson is the new home of the Montreal Canadiens and is next to the Windsor Station (corner of de la Montagne and St. Antoine) in the core of downtown Montreal. The Molson Centre was financed entirely with private funds by the Molson Companies at an estimated cost of $230 million ($130 million for the arena, $50 million for the land, and $50 million for equipment and furnishings). After residing at 2313, rue Sainte-Catherine ouest since November 29, 1924, the Montreal Canadiens, following the lead of the Canadian Capital, Ottawa, decided to build a new arena for its team, fans and corporate sponsors. The new arena seats 21,273 fans and has 135 private suites that hold 16 patrons to a suite. There are five television studios on ice level and room for 140 media members. * Official opening: Saturday March 16, 1996 ( vs. NY Rangers). * New Prestige Section (first eight rows). 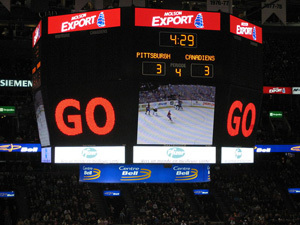 * Giant full-color scoreboard with animation. * Skating rink mesures 85 x 200 feet, the regulation NHL dimensions. The ice sheet can be frozen in 12 hours. * 140 work stations on a circular catwalk. * A large press conference room at ice level. * 50 stations in a work room at ice level. * Eight broadcast booths for TV & Radio. * A luxurious lounge for the media. * Four indoor areas for TV mobiles. Located in the heart of Montreal, surrounded by de la Gaucheti�re, de la Montagne, Saint-Antoine and Peel Street, the Molson Centre is accessible to all. By M�tro and by bus Lign 2 (orange) of the metro serves both Lucien-L'Allier and Bonaventure stations. Commuter trains Close by is the Windsor Train Station. Also accessible from the Central Train Station. By car Highways and bridges will get you there. Autoroutes 10, 20, 40; Champlain, Victoria, Jacques-Cartier and Mercier Bridges; Louis-H.-Lafontaine Tunnel. MONTREAL (CP) - Good ice, hard boards, soft glass. That was the consensus from Montreal Canadiens players after their first practice in the gigantic new Molson Centre. "It's a fantastic building - great ice," said right winger Mark Recchi after a two-hour workout at the 21,450-seat facility before about 200 hardhat-wearing media and construction workers. "We're a good skating team and it should be to our advantage." The new rink is all but completed, with only finishing work - from painting railings to laying carpets in private boxes - still in progress. To get used to the quirks, bounces, lighting and atmosphere of the new rink, the Canadiens will practise several times at the Molson Centre before playing the first game. What the players liked was that, unlike the old Forum, there are no metal dividers between the panes of glass atop the boards, so there is less chance of a quirky bounce off the dividers. There isn't quite the same bounce off the glass, however. "When you shoot, the puck hits and just dies," said centre Saku Koivu. Just like the old building, the boards and glass are rigid, giving true bounces but also making bodychecks painful. There are spacious new facilities for the players, such as weight rooms and training rooms. There simply wasn't space for them in the old Forum, which had 16,259 seats. What remains to be seen is whether the dynamic atmosphere from the old Forum can be transferred to the new. It should help that seats in the new rink are steeply banked, keeping spectators close to the ice. "We've got to look at it as a positive thing," said team captain Pierre Turgeon, who was first to set a skate on the Molson Centre ice. "It will be sad to leave the old Forum, but we've got to see the new arena as positive for the team. "There's better facilities and everything. It will be an adjustment, but we'll get used to it." The Centre Molson is located in the heart of downtown Montreal between de la Gauchetiere, de la Montagne, St.Antoine and Peel street. There is plenty of indoor and outdoor parking space around the arena and two subway stations (Bonaventure and Lucien-L'allier) have direct access to the Centre. 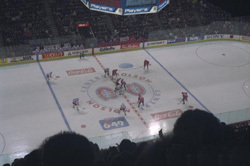 On September 7, 1997 Jeff Brock writes: "As a past season ticket holder to the Air Canada Club section at the Molson Center, I'd like to give some feedback. The arena bowl itself has excellent sightlines, although as in all the newer arenas, most of the seats are much higher off the ice. The Molson Center however was built on a site that was much too small. As a result the 2 main public concourses are two small by approx. 100,000 sf in total. This allowed The Molson Companies a saving of approx. $20 Million in construction costs but greatly inconveniences the public." I've been to the Corel Center (designed by Rossetti see the Palace at Auburn Hills) in Ottawa and it is far superior to the Molson Center. The Molson center was designed by a local firm of architects who have never designed an arena before. This is unbelievable but true. This "local content" is related to the tribal Quebec nationalism that you read about from time to time, as well as to Molson's desire to save approx. $20 million in construction costs. I do not believe HOK, Rossetti or Ellerbe Becket would have been party to such a deal. The public concourses are jammed packed shoulder to shoulder during the pre/post game and during the intermissions. Understandibly the patrons of the $90/seat prestige and $80/seat reds are quite upset. The fact that smoking is permitted in all public concourses and that Quebecers are big smokers only adds insult to injury. Molson Inc. plans to hold on to the NHL Canadiens, but it wants to sell the three-year-old CAN$235 million Molson Centre. The brewer says high property taxes are the reason. The facility has 135 luxury suites, which include a private rest room, kitchenette and living room. There are also three restaurants, including the 190seat Air Canada Restaurant. Molson provided funding for the new Molson Centre privately with no public assistance. Club seats provide additional income through a $1,600 yearly license fee. Molson said it was also open to taking on a partner in the enterprise or in refinancing the arena. 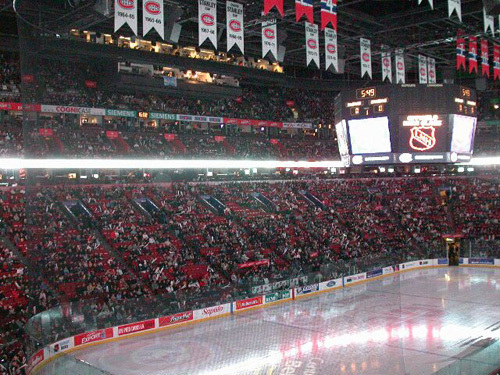 January 20, 2007 - Montreal's Bell Centre is located here in the Mecca of hockey - Montreal, and is the home of hockey's most storied franchise - the Montreal Canadiens. This arena opened in March of 1996, in one of the most solemn of ceremonies as the team's 24 Stanley Cup banners and the retired numbers of their icons of icons were brought over from the Forum and hung here to remind everyone that this is no ordinary NHL arena. The facility is located in the middle of downtown Montreal, adjacent to a number of top hotel properties and just a few blocks from the fabulous Rue St. Catherine, the hub of Montreal's shopping and nightlife. Surface parking and ramp parking is close to the arena, with some parking running as high as Cdn$15. The best way to go to the arena is by taking the subway... easy access to the building is available from the underground Metro station (Bonaventure or Lucien-L'Allier stations). Underground causeways will take you right into the building without having to set foot outside. The Windsor rail station is right next door, offering commuter service from points outside Montreal into the arena and the city center. The building itself is tightly bound by four city streets, therefore providing little area for a public plaza or open gathering area outside. The Rue de la Gauchetiere entrance on the north side serves as the building's main entrance, and this is where you can find the outside entrances to the team store, called the Canadiens Boutique, and a sports bar named La Cage Aux Sports, both open both during the games on non event days. The building is tall and high, due to the constriction of space, and this makes for a very massive and imposing building. Bars, restaurants, shopping, hotels and nightlife are all within easy walking distance, or via the Metro system, with access to downtown Montreal's vast underground concourse network. This is a vibrant, bustling and electric city, and with French bring the primary language, a city with a European feel. First of all let's say this - very narrow concourses for an arena this new. Navigating the concourses is a difficult chore here. Again, this is due to the fact that this building was put up within the constraints of a narrow city block, and the configuration of the building is a vertical one. In a couple of nooks, restrooms are actually accessible only via a staircase. To add to the congestion, there are lots of pillars in the way as well. Throw in concession lines and it is virtual gridlock. Gratefully, since our first visit here the Province of Quebec enacted strict new smoking restrictions, so the puffers are now relegated to outdoor spots to indulge in their favorite passion. 21,273 seats - Yikes! This is one big place. The lower bowl goes up some 30 rows, and then there is a club level, which is high enough to be in the 300s in most other arenas. And yes, they even have a 400 level here! The seating pitch is very steep here in all three levels, so fans are really on top of the action. We made the trek to the top of the building, and after catching our breath we came to realize the bar has been raised for nosebleeds in hockey. The seats are wine red, with the upper deck seats colored grey and blue, somewhat reminiscent of the colors in the old Forum. A press gondola hangs from the rafters all around the seating bowl, partially obstructing the panoramic view of the bowl from the highest seats. In the center is an 8 sided scoreboard, and a 360 degree digital LED board wraps around the club level balcony. Backlit ad panels and small dot matrix information boards can be found along the upper level balcony. The Air Canada Club is in the 200 club section and the club concourse lounges, named Le Pub, resemble an english tudor inn. The Classe Affaires Restaurant serves up fine dining with a great view to the outside. Complimentary concession food is available to all club seat holders. Another upscale restaurant, La Mise au Jeu, is located off the main concourse on the ground floor, with mahogany woodwork and furnishings, nicely appointed decor, and attractive lounge areas and light fare offered, including carvery and pasta stations. This restaurant is named after a similar facility brought in the old Forum, and is open to all ticket holders. Good luck finding any variety of food items here. Plenty of concession stands, but they all serve the same ballpark dreck....the overwhelming majority being hot dog stands. The specialty food item in Montreal is their famous Smoked Meat, and there is one stand here that sells this delicacy, just down the staircase near section 105. The main team store is called the Canadiens Boutique, and many satellite souvenir shops are scattered throughout the facility. The sports bar is called La Cage Aux Sports, and is also located on the 100 level. Ah yes - no silliness here. 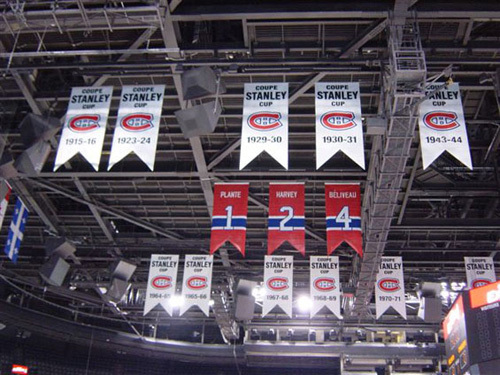 Montreal's 24 Stanley Cup banners provide an imposing backdrop, and add to that the names of eleven - only eleven of their greatest stars - M.Richard, H. Richard, Beliveau, Lafleur, Harvey, Vezina, Plante and Moore among them. There is also a large exhibit in the 100 level concourse, showcasing many more of their greats with bronze plaques and biographies. This team presents its proud tradition very well. Added later was a single banner commemorating the MLB Montreal Expos... "1969-2004", with the team crest and numbers of their four greatest players. Very nice!!! One quick note to think about....it's been 14 years since this franchise last won a Stanley Cup....almost unimaginable isn't it! Hat Trick - to the old Montreal Forum at the corner of Rue Atwater and Ste. Catherine. The old arena has been gutted and turned into a retail and entertainment complex, yet the actual center face off circle has been marked and maintained, surrounded by some of the old seats and enough memorabilia to make the ghosts in this storied building come alive. Still a must visit for the devoted hockey fan. Hat Trick - nothing to do with the hockey experience here, but you gotta try the Smoked Meat, a tried and true Montreal delicacy. These sandwiches are similar to NYC deli corned beef, but have their own distinctive taste. Head over to Schwartz' Deli or La Main, both on Boul. St. Laurent just north of downtown. Penalty - to the audio people at the Bell Centre. On our second visit here, they opened "Hockey Day in Canada", the first of an all-Canada tripleheader, with a rendition of "Oh Canada" in three languages, Inuit, French and English, shown on the video board via satellite and performed by a children's choir in Iqaluit, Nunavut. We saw them on the screen just fine but due to a glitch, never got to hear them perform. What a disappointment! Assist - le karma du dernieres nouvelle sportives de route et mises a jour makes its way to the Bell Centre as the Canadiens down the Edmonton Oilers on this afternoon by a 3-2 count. Ole!! Assist - The dredlocks of Edmonton forward Anson Carter....we don't think words can describe it....so we won't bother, definitely very unique to say the very least! Assist - The Canadiens have adoped the former mascot of the Montreal Expos - Youppi! Youppi entertains the fans and a children's play area called Youppiville contains games and nice exhibits commemorating the MLB Expos and their time here. Penalty - Where the heck was the violin player in the stands!!!! A truly different aspect of our first visit here was nowhere to be seen or heard....bring him back IMMEDIATELY!!! Penalty - Yes it gets cold in the wintertime, especially in Canada....but negative DOUBLE DIGITS Fahrenheit for goodness sakes!! All right so it was in the minus single digits on game day, but strong gusts of wind made vital functions such as breathing a difficult chore while walking outside. Because this is Montreal, and these are the Canadiens, a visit here automatically becomes a special one, simply because of this franchises' great and storied history. Attending a Canadiens game, seeing those banners, feeling the sense of history, singing the national anthem in French... it is all enough to give one chills. That being said, the Bell Centre does not make it to the top of our list, due to the negatives of the design and the atrocious lack of wide public spaces in the building. But this is still Montreal, a world class city, and these are still the Canadiens, so we would recommend making the trip here and checking it all out for yourself. We'll make it back here again, you can be sure of it! Montreal, Quebec - The next generation of the Molson family says it is considering reacquiring control of the Montreal Canadiens and the Bell Centre arena from George Gillett. Gillett bought more than 80 percent of the team from the family in 2000 while the family retained 20 percent. The move is led by 38-year-old Geoffrey Molson. The family did not discuss details of the plan or its financing. The plan was described as being in its early stages and subject to change. The MolsonCoors brewing firm would not be involved in the deal. Gillett carries a large debt from his purchase of the team and he is working with partner Tom Hicks, owner of the Texas Rangers, to refinance their debt on Liverpool's English Premier League team. In addition to the Molson family, Quebecor Inc. and BCE Inc. are bidding for the arena and the team.